On January 14, 2015, a bold, brilliant, 28 year old African American woman held a phone up in front of her face and began to speak. “Hey, y’all… so… I don’t know where to look…” she said with a smile that could charm the sting off a bee. Rarely has such an important act in history taken place with so much casual and unscripted authenticity. 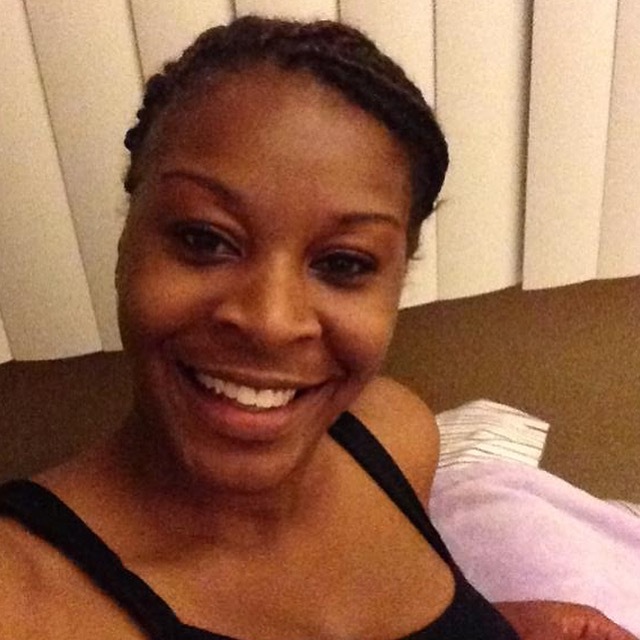 When Sandra Bland’s moment came, she said yes. The calling to begin making her #SandySpeaks videos was weighing so heavy on her that night of January 14, that she began at the end of a long day with a dying phone battery and curlers in her hair. The gravity of the calling left no time for vanity. Sandy set out to explain that she was not making her videos to hear herself talk: Sandy spoke so that others would be heard. Sandy spoke so that those who were silenced would be seen. And through her videos, Sandy still speaks. While the ethos that children are “to be seen and not heard” still echoes in our society, Sandra was determined to lift up even the smallest voice, such as the voice of her two year old niece, whom she mentioned with such reverence. Pronouns are important, if I have learned nothing else this year, it is that. Sandra Bland used them to perfection. She knew what she could do. She knew what we could do. She knew what you could do. 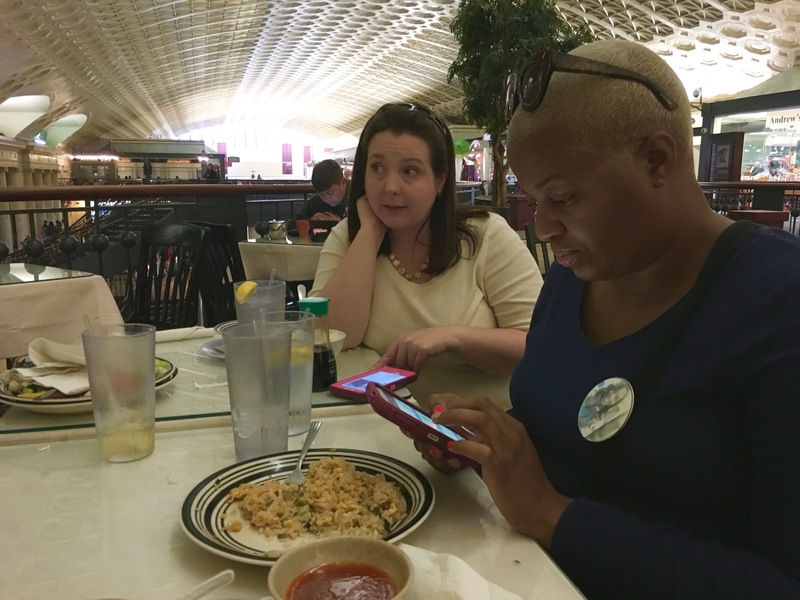 Sandra Bland sat there, with her curlers in her hair, and her phone battery dying, and she started a revolution. Why? Because she believed in you just that much. She believed that we would do it, because she believed that you could do it. She believed that we would change history, because she believed that you could change history and she could change history. Maybe when no one else believed in you, she believed in you; and she trusted you to do something. While the confidence of a woman who is loved by her family, devoted to God, and aware of her worth exuded from her smile, she also clearly understood that she would not be able to carry out her calling alone. She knew that she had to take action, and she was ready to lead by example; but she also knew that she could not do it alone. When Sandra Bland’s friends and family woke up on January 15, 2015, they discovered the video that Sandra had posted the night before at 12:04 am. Many of them recognized the passion in her voice and responded. Yet, none of them could have known how sacred this record of her calling would become to millions of people around the world until they woke up on yet another morning, only two days shy of six months later: July 13, 2015. There’s an image burned into my memory that never goes away. I see it more and more this week as I approach the 100th Day of standing in solidarity with Sandra Bland. When I close my eyes, I see two women sitting side by side, one in a black and white patterned dress, the other in something less subdued, yellow, I think. But I don’t really see the clothes; it’s not the clothes that matter, or the hair, or the shoes. All I really see are the eyes. Overflowing with a kind of grief that I had never seen before. Nine days earlier, not far outside the doors of the very church where we gathered, their young, vibrant sister, Sandra Bland, had been taken from her car. She had been threatened, she had been thrown to the ground, she had been arrested. Whatever the charges said, her main crime was not a crime at all, but something the women I respect most strive to practice on a daily basis: the refusal to prioritize a man’s ego over our rights and dignity. Yet, even so, what happened to Sandra Bland would not have happened to me; because when my parents gave “the talk” to their white daughter it was about how to avoid getting a ticket when pulled over, not about how to stay alive. The “get home safe talk” is not a conversation white parents have to have with their children; which is why I have limited patience for conversations about what Sandra should have done to avoid police brutality as a black woman, because there should not be a different set of rules for her and for me. Yet, there is. And police brutality should not be something she should have to learn how to avoid, because police brutality is something that simply should not exist. None of those things were running through my head, however, when I looked down into Sharon’s eyes and Shante’s. All I could think about was the pain they were enduring, and the fact that they should not have to be there to pick up the body of their baby sister. 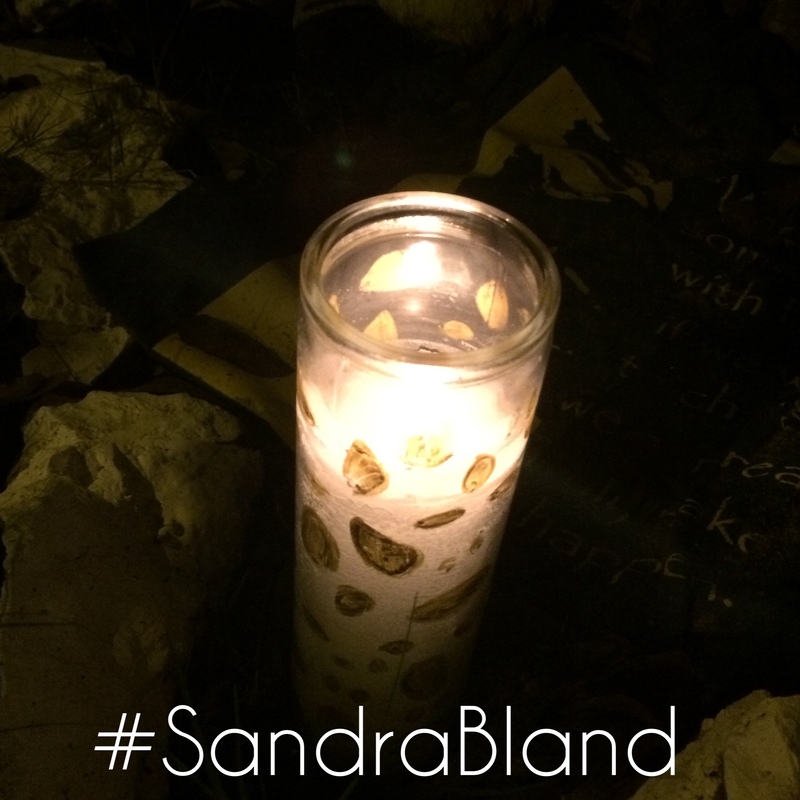 Sandra’s voice in her first #SandySpeaks video was still ringing in my head from the first night, five days earlier, that I had gone to the Waller County Jail with my friends Rhys Caraway and Nina Bernardin to #SayHerName and ask #WhatHappenedToSandraBland. Sandy had said in her first video, “I can’t do this alone, I need y’all’s help. I need you.” She did not know at the time why those words would become so necessary. 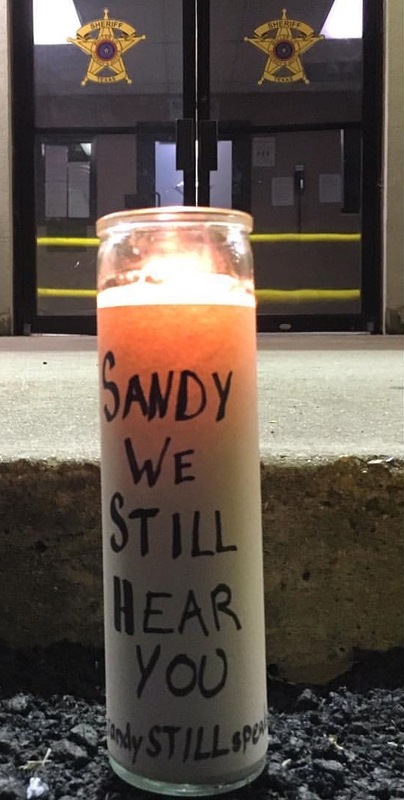 Seven weeks later, I found myself standing late at night outside that church, at the memorial that still remains at the scene of Sandra’s arrest. I had not planned to be there, but a friend from out of town had wanted to come. So, after letting her fill me with tacos and sweet tea, I had made the drive out to Waller County for the second time that day. Not many weeks more passed before I actually was there with them, in Chicago, at Sandra’s home congregation of DuPage AME. I was not in an easy spot personally. For many weeks through record breaking temperatures in Texas, I had asked myself how long I could do this physically. 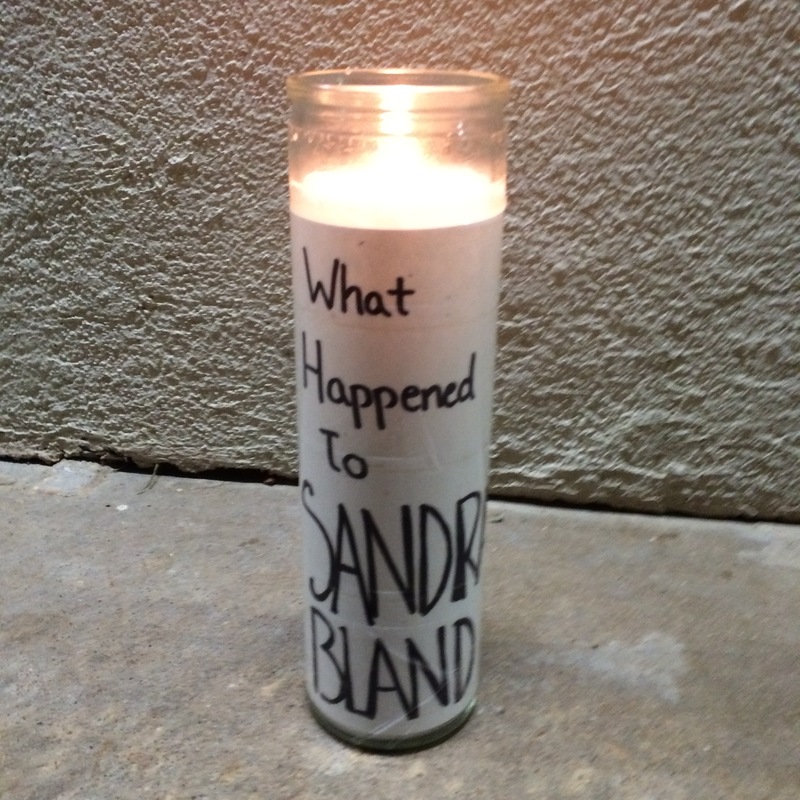 That night in front of Sandra’s memorial I had found my peace to that question. Yet, now a new question had arisen, which was how long could I do this emotionally? Sitting in the pew, about half way back on the right, I looked up at the large stained glass behind the pulpit. Once again, I felt my world shift. This time it was God who challenged me. I felt in my spirit the questions coming fast: You have committed to people, to Sandra’s sisters and to Sandra, but will you commit to me? Will you stay where I have called you and where I have placed you, no matter what anyone says about you? God has really opened up my eyes to the fact that there is something we can do. And as quickly as that, all of my questions went away. I was no longer concerned about how long I could do this physically. I was no longer concerned about how long I could do this emotionally. Because I knew that I had been asked if I would do this spiritually, and the answer was yes. Sitting next to Shante, whose eyes had evoked a response from me drawing me deeper into this journey nine weeks earlier, I felt a certain peace wash over me. This was going to take a while, but it was going to be okay. The second week of solidarity with Sandra Bland, a friend had asked me in frustration whether I would be doing this for 100 days. “Of course not,” I had replied incredulously, “That would be crazy. We just need a couple weeks and we’ll have some answers.” Now I knew, that it would take much more than 100 days. It might take a year. It might take more. Yet, I knew in my heart that I could share a year or two or more of my life with Sandra Bland. How could I not, when all of the years of her beautiful life had been taken away. “That’s Bernie Sanders,” my sister said, indicating an unpretentious man with a full head of white hair that had slipped past me and tucked himself into a table in the shadowy corner of East Street Cafe, a Thai restaurant in Washington DC’s Union Station. “Really? Are you sure?” I asked her doubtfully, as I took another bite of my basil chicken across the table from Ms. Geneva Reed-Veal. For better or for worse, he was not a man who had quite the signature look that more polished politicians cultivate; which is probably part of his charm. I find it wise to do what my big sister tells me on the rare occasion that she tries to exert her seniority, so I pulled my chair back from the table and walked across the restaurant. “Hello, I’m sorry, are you Mr. Sanders?” I asked. I got up to walk back towards our table only to see that Shante, Sandra’s oldest sister, was already headed towards me. She is a woman who knows how to get things accomplished, so I was not surprised to see her coming after me to see if I needed support. Bringing Ms. Geneva back over to the table, I felt my body trembling. The trembling continued as Ms. Geneva sat down next to Senator Sanders and they began to talk. I was not trembling out of fear or out of being star-struck, it was more that I was completely blown away by the unexpectedness of it all, the sacredness of the moment, and the sincerity of all involved. You do not often get to witness moments like that. Moments when agendas are laid aside and people who might not otherwise ever have the chance to connect without cameras watching can simply honor one another’s pain and humanity. “What happened to your daughter is inexcusable,” he said. “We are broken, and this has exposed us.” He then continued by promising that he would continue to #SayHerName #SandraBland and would not give up in the pursuit of justice. The spontaneity of the moment lent sincerity to words unrehearsed, phrases unplanned, in an interaction that was never supposed to take place. There have been so many moments along this journey, so very many moments, when God simply astonished me. When something happened that was so delicately balanced in the table of time that it gave me confidence that there was something truly important happening, something truly historic, something truly sacred, as the continuing story of Sandra Bland unfolds. When each sacred moment appears and passes, it gives me renewed hope and confidence that the legacy of Sandra Bland’s struggle for justice is making it’s eternal mark in this world. Senator Sanders was right. Her death was inexcusable; yet her legacy moves forward without yielding. 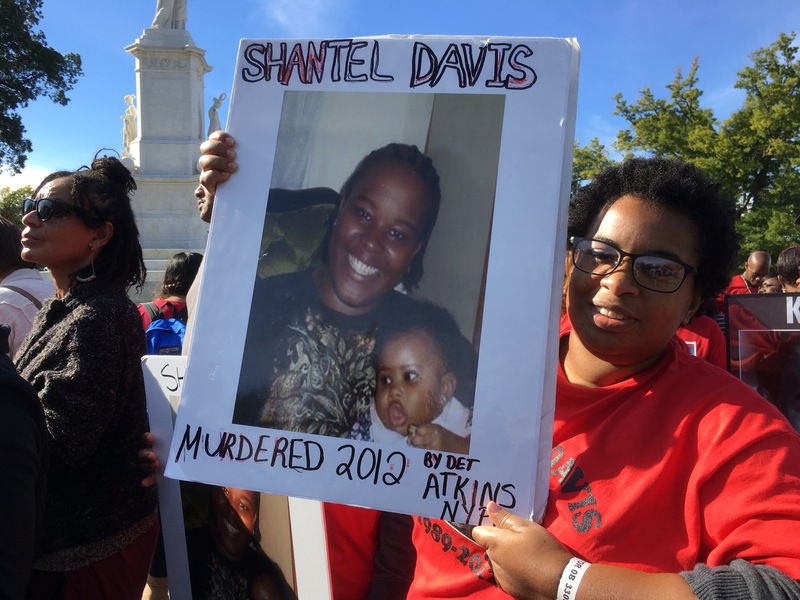 “Hey, I am from Houston,” I said recognizing the gentle face of the woman walking next to me among the families of those lost to police brutality walking together to the 20th Anniversary of the Million Man March. Behind us in a sea of red shirts was Trayvon Martin’s mother, ahead of us Michael Brown’s father. 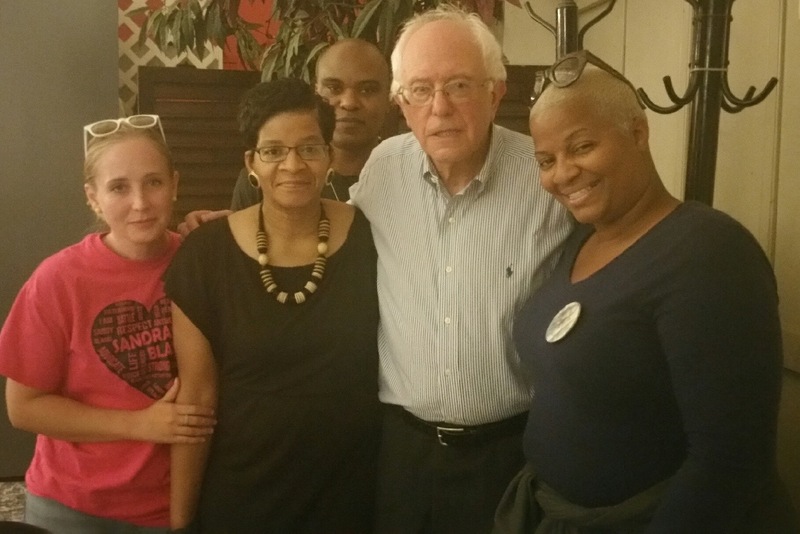 To my right, was the family of Sandra Bland who had become like family to me. To my left was the beautiful woman with the long hair from the city where I lived. 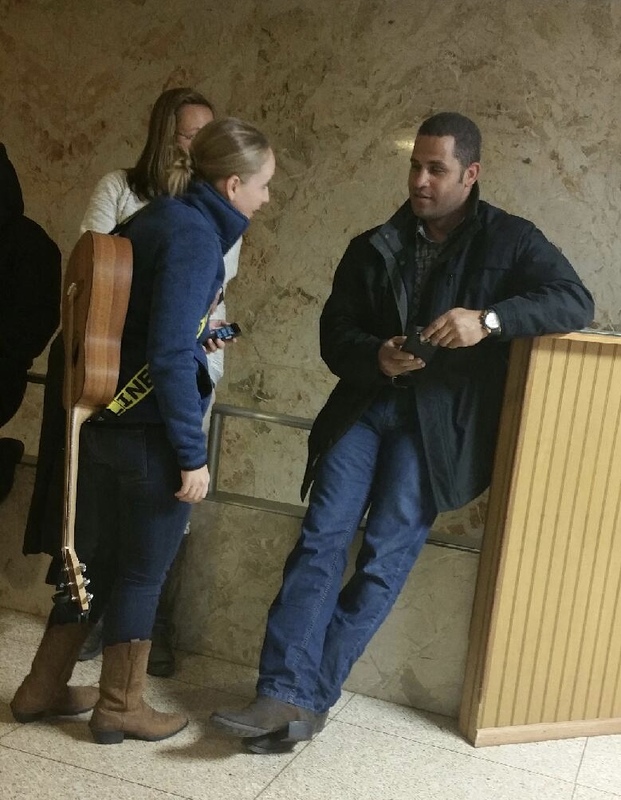 “Hello, Hannah,” she said, recognizing me from advocacy meetings in the city of Houston that we both called home. A moment of painful awareness washed over me as I realized that she remembered my name, and I did not remember hers. It is Janet Baker, by the way. Janet Baker. Janet Baker. Janet Baker. Remember it. It is important. She is the mother of Jordan Baker. Jordan Baker. Jordan Baker. Remember it. It is important. “I’m so grateful to find myself beside you. God has an amazing way of bringing us to the right place,” was what I said out loud. But through my mind raced a million thoughts. Why could I not remember her name, when she could remember mine? Why was it that it had been at least a month since I had checked in on what was happening with her? What had we done lately in the city of Houston for her son, Jordan Baker? 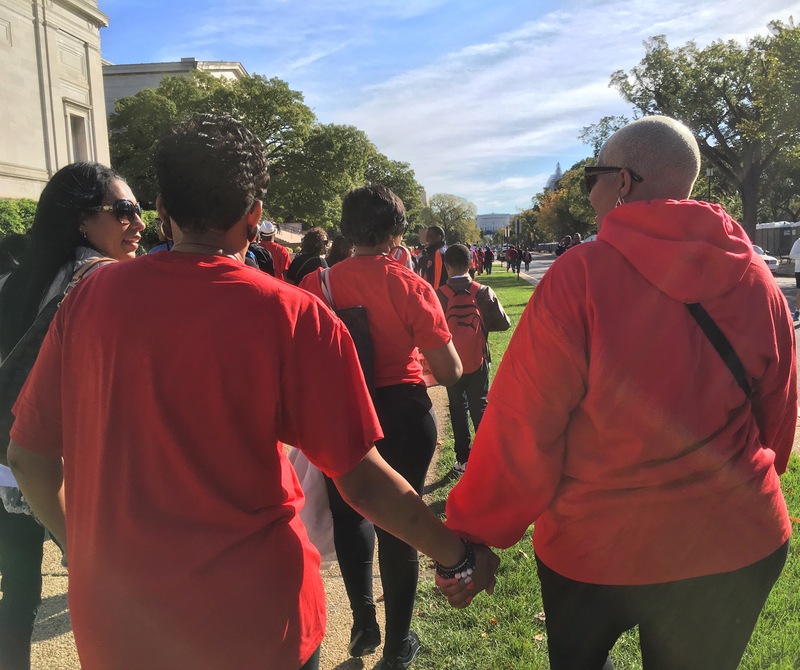 Walking in the midst of a sea of red shirts, the parents and brothers and sisters of those still seeking justice, I felt overwhelmed both by the sorrow and the beauty of it. Mothers from different cities who had to fight for their children when no one except each other could really understand, walking arm in arm with one another at last. They have been talking. They have been building a new kind of family. They have been seeking to hear and support one another. They have been pushing back against the “hashtag survival of the fittest” struggle for the public’s attention that social media layers onto their mourning process, and they have been building community and solidarity. Many of them carried signs with pictures, putting a face with a name for the lives that had been lost. Many names were as recognizable as the main street in your hometown; while Sandra Bland Parkway actually was a street name itself. Others, I will be honest to admit, I had not heard before. I was grateful to those who had a face to go with those names; it helps them stay in the memory. You cannot always explain why some hashtags take root and grow, and others have a shorter lifespan. You can say it’s because Tamir was young. You can say it’s because Sandra was educated. You can say it’s because Trayvon was innocent and hunted. All of those things are true and important, but they can be said of others as well. Someday someone will write a doctoral thesis to explain why, in fact they have probably already started to write it, but for now we bear the responsibility of remembering that no life is more valuable than the next regardless of how long we are able to keep their name moving. The homecoming queen is not more valuable than the trap queen. The minister is not more valuable than the drug dealer. If we lose sight of that then we lose the whole battle to say that #BlackLivesMatter. Every. Single. One. Matters. The one thing that got her really fired up more than any other was the loss of life, and people’s indifference to it. That extended even beyond police brutality to her concern about violence in the city among young people when the weather got warm, and the homicide rate rose. Life was important to Sandra Bland. Stopping those who took the lives of another was often the focus of her videos. Then her life was lost to us, and we still do not know exactly how. 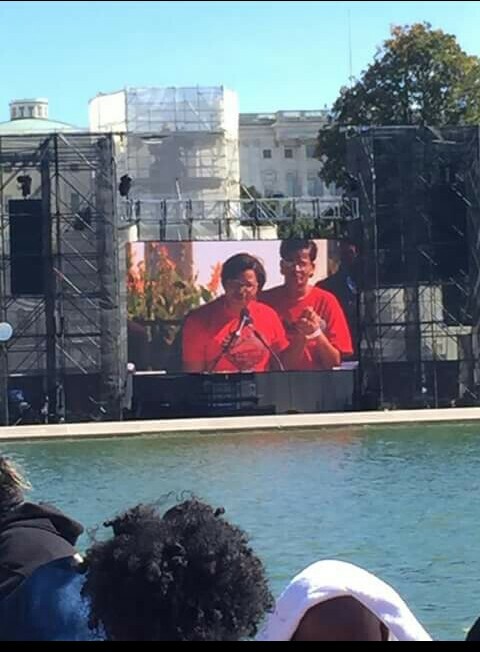 As the 20th Anniversary of the Million Man March began, Sandra Bland’s mother did get to see her daughter’s face on the screen. She did get to hear them #SayHerName as out of all the families gathered, the family of Michael Brown and the family of Sandra Bland were the ones each given one minute to speak. Yet, it was not the victory of hearing one daughter’s voice or the other daughter’s name that dominated her mother’s thoughts for the rest of the day. It was all of the names that had been left unsaid. All of the faces that had been left unseen. All of the families that had been unheard. She was not thinking about herself, she was thinking about the other women she had walked arm in arm with to that place. The mothers whose stories Sandra Bland had watched unfold herself as she continually sought creative ways to take action in the struggle. The mothers that Sandra Bland herself had mourned alongside as she lifted up the words: Black Lives Matter. In the midst of walking through the greatest pain of her life, Ms. Geneva Reed-Veal still is thinking about the suffering of others. She is still strong enough to keep room in her heart for other’s losses along with her own. This should not come as a surprise to anyone. It takes a strong woman to raise a strong daughter, and this is the woman who raised Sandra Bland. *It is important to remember that many times the reason that names fade from view is that the family becomes drained of resources in their fight for justice. Help the Bland family continue their fight: Family Legal Fund.